Baptisms around this time do not record the person without whom a birth is impossible (the mother), and rarely record occupations or residences for the father. [S2800] FHL Film 1425557 FAIRBAIRN, Henry A (1855- ) - Biography, Birth 1670 Dth ? George FAIRBAIRN, Par. of St Boswells, ROX, pg 219 extracted Dec 2008. [S56] Scottish BMDB entries (from 1855), http://www.scotlandspeople.gov.uk/index.php, Marr. 17 Feb 1699 George FAIRBAIRN & Jannet KIYLL, St Boswells, ROX 804/0010 0184, copy d/loaded Dec 2008. [S2800] FHL Film 1425557 FAIRBAIRN, Henry A (1855- ) - Biography, Marr. George FAIRBAIRN & Janet CAILE, Par. of St Boswells, ROX, pg 219 extracted Dec 2008. [S110] Scotlands People Index, "OPR Roxburghshire, Scotland, FAIRBAIRN Births 1538-1854", Bap. 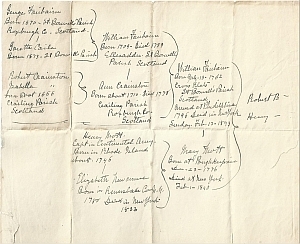 1690 to 1715 to George FAIRBAIRN, St Boswells, ROX, extracted Feb 2014.